Description: This dagger is typical of the type used by Bedouin nomads in Jordan/Israel/Palestine, and measures 10 1/4” with a 5 3/4” straight, asymmetric, double-edge blade with shallow center spine. The blade has been fairly roughly shaped and polished, with visible tool marks on both sides, as well as a slight flaw just below the tip (which is very slightly bent). The reverse of the blade has an Arabic inscription, and the “I” shaped hilt has decorated sheet silver on the outside surface, dark sheet tin on the interior (as does the scabbard). Large areas of solder are visible on the pommel area, as well as on the wire decoration at the throat of the scabbard. 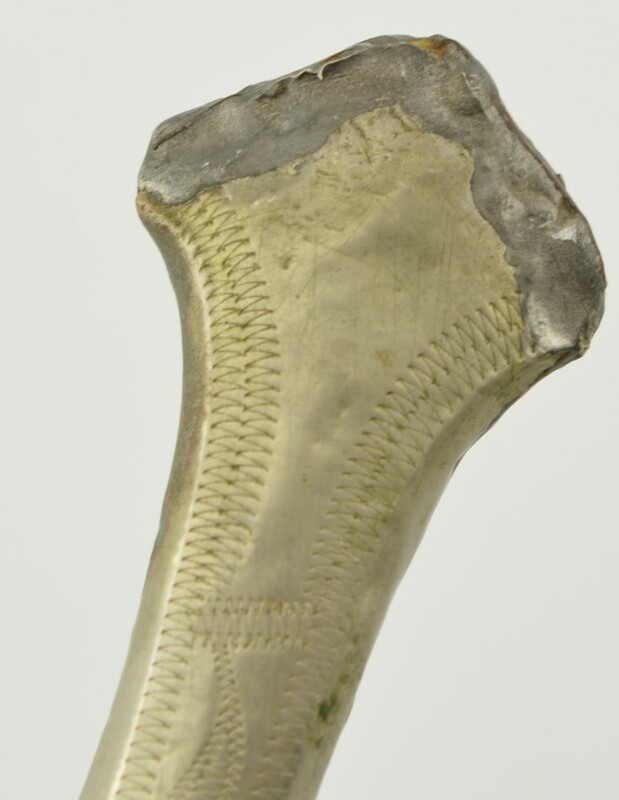 This is a neat Middle Eastern dagger, and is in very good condition overall.